David Surette's poems are sharp as a hockey skate, and slice the ice of Malden memories with the precise descriptiveness of Elizabeth Bishop. These are poems that consecrate with a benediction of blue-collar words that secret a Blakean soul-surprise. A collection to make one immediately call home to family, living and lost. 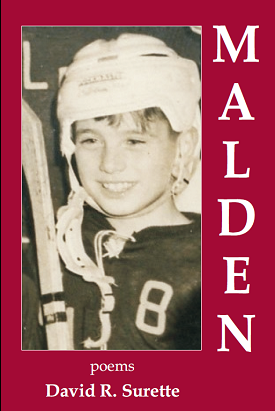 These poems contain an entire storehouse of memories, emotions and legends from a Boston boyhood. Readers witness a whole series of initial encounters including nuns, schoolrooms, hockey, the Beatles, grade school crushes, and adventures with friends. Sharp details branded into a child's impressionable mind are brought back into focus with humor, candor, true affection, and the wisdom of the intervening years. both in blazers, his powder blue, mine red. invention of upper class pretension. bathed in the ink of today�s news. with the timing of that chair pull.